This month’s edition of the magazine Newtype had an interview with the director of the upcoming film Tamako Love Story, Naoko Yamada, this month. This is a translation of said article. Thanks to violaxcore for editing assistance. 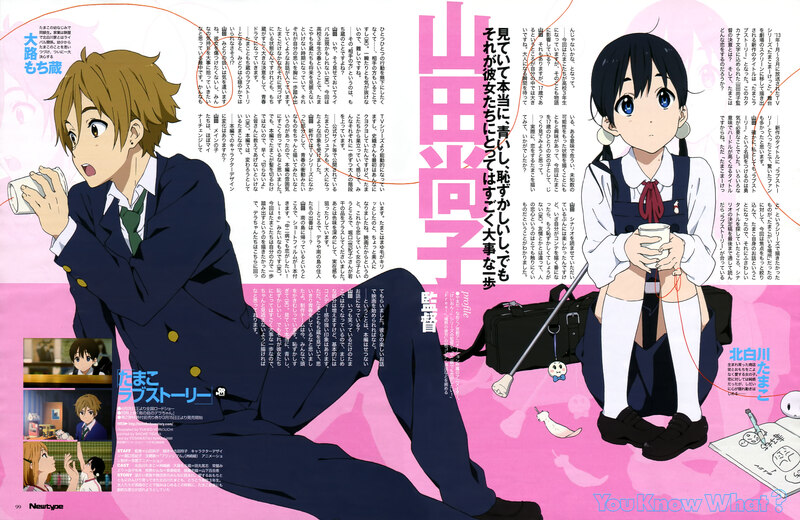 The television series Tamako Market aired from January until March in 2013. As the tale moves to the big screen, the new title is Tamako Love Story. What did director Naoko Yamada pack into these letters? Also, what’s this about Tamako falling in love? – The movie’s title has “Love Story” in it. Many fans were also surprised to see that title. Yamada: I definitely think you have to have courage to stick that particular noun onto something. It’s definitely a title that sets the bar high with multiple meanings behind it. In contrast to the TV series, which had “Tamako Market” depicting “The place where Tamako lives”, I wanted to choose a title that was more refined since this was a story that focuses on Tamako herself. And so I searched for an appropriate title. I read over the finalized version of the scenario over and over and then thought “isn’t this a love story?” And so it was. -　In the movie, Tamako has become a third year in high school. How does that influence the story? Yamada: It also has an effect on the tale; being seventeen is a big moment in anyone’s life. From the very beginning, I wanted to depict that point in life where you’re looking forward to becoming an adult, a bit uncertain about what’s going on, and where countless possibilities await you. I think you’ll be able to see that in this movie as Tamako is seventeen. – How does Tamako look when she’s in love? Yamada: When I was reading the scenario, that part was quite enjoyable to read, but as I moved to the storyboards, they became a bit embarrassing. Nothing you can do about that. (laughs) People in love act differently than they act around their friends; they’re more emotionally impressionable. You don’t want to refuse anything that person asks… you take their side of things… (laughs) It’s so difficult never being able to relax for a moment. – And so that “their side” would be Mochizou’s, right? Yamada: Well, you’ll have to watch and see. A rival may show up. (laughs) This movie takes place in the spring of everyone’s third year in high school,where they all can’t avoid looking at their futures. Each of them have their own thoughts in mind they clutch close as they take a step forward. It’s not just Tamako who notices the situation; Mochizou makes a big decision and it becomes an adolescent drama. – With Tamako and Mochizou in a love story, it doesn’t look likely that Midori will be able to calm her heart! Yamada: I was very particular about how to treat Midori in the film. I didn’t want to hurt her feelings; everyone is in the middle of finding themselves. Kanna’s more energetic than she was in the TV series, I also worried about Shiori-san from the very start, but everyone feels like they’re about to leave the nest and become adults one step at a time. – The key visual and image used elsewhere of Tamako also gives the impression of becoming an adult. Yamada: The movie is something not part of the TV series, so the image depicts something like an adolescent urge that greatly matched the atmosphere of the film. However, Tamako doesn’t get her hair cut in the film, so I had to quickly tell everyone “She doesn’t cut it!” (laughs) She does change in the movie though. – Were there any alterations to the character designs? Yamada: The main girls have had some minor alterations. Tamako’s eyelashes have been spruced some to make her look more beautiful. Since it is a movie, I asked (Yukiko) Horiguchi-san to add a few things from other works since she’s a girl who’s in love. Also the hues have been heightened to add a more realistic feeling. – By the way, will the island characters be appearing….? Yamada: There’s a short film with the movie that takes place after they’ve returned to the island. Something like a Chuunibyou Lite short. (laughs) I wanted to depict Tamako advancing in life, so that short could fit them. It should be a fun tale to start the movie. – So does that mean the main story will have some sad portions? Yamada: Tamako hasn’t changed from her usual smiling manner. The serious portion has increased, but there’s still a strong comedic sense in the film. However, looking at Tamako and Mochizou will make you think of being young. Everyone on the team now has been plucking their heads from all the embarrassment. (laughs) It depicts a naive, embarrassing, but yet important step forward for all the characters. You won’t want to miss it. And that ends this particular interview. It had a lot of juicy portions, so I felt a lot of people would like to see it. Other magazines will be done on a case-by-case basis. This entry was posted in Kyoto Animation, Tamako Market, Translations and tagged diector, interview, love, naoko, Story, tamako, yamada. Bookmark the permalink. I’m still hoping they’ll pull an MGS2 and subvert what you’d expect from the promotional content (i.e. I hope Midori “wins”), but it’s one heck of a long shot at this point. I just can’t stand milquetoast characters like Mochizou… Not when that’s their defining trait, anyhow.